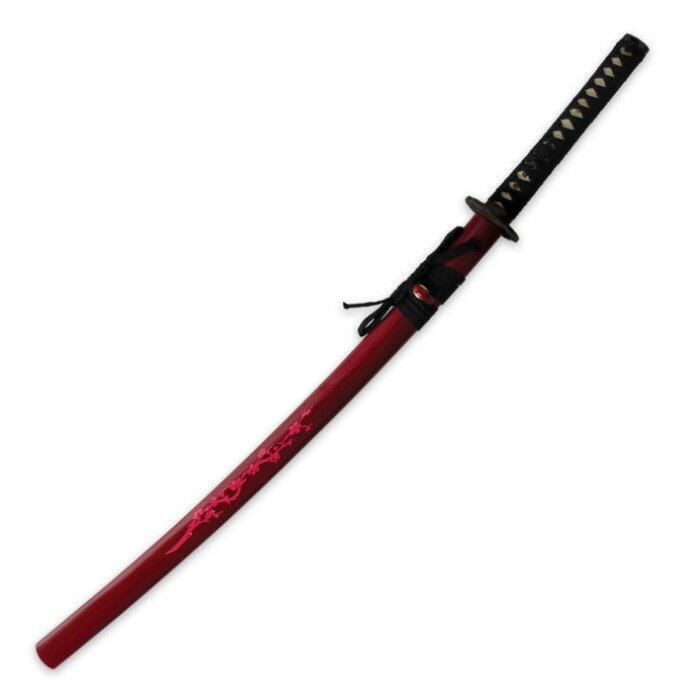 The bloom has blossomed on this stunning carbon steel katana sword, featuring a 27" traditionally designed blade complete with a blood groove. The elegant handle features imitation ray skin with heavy black wrappings. Additional accents including an antique brass hakabi and menuki and a cast zinc alloy tsuba give this katana an elegant finish and regal feel. 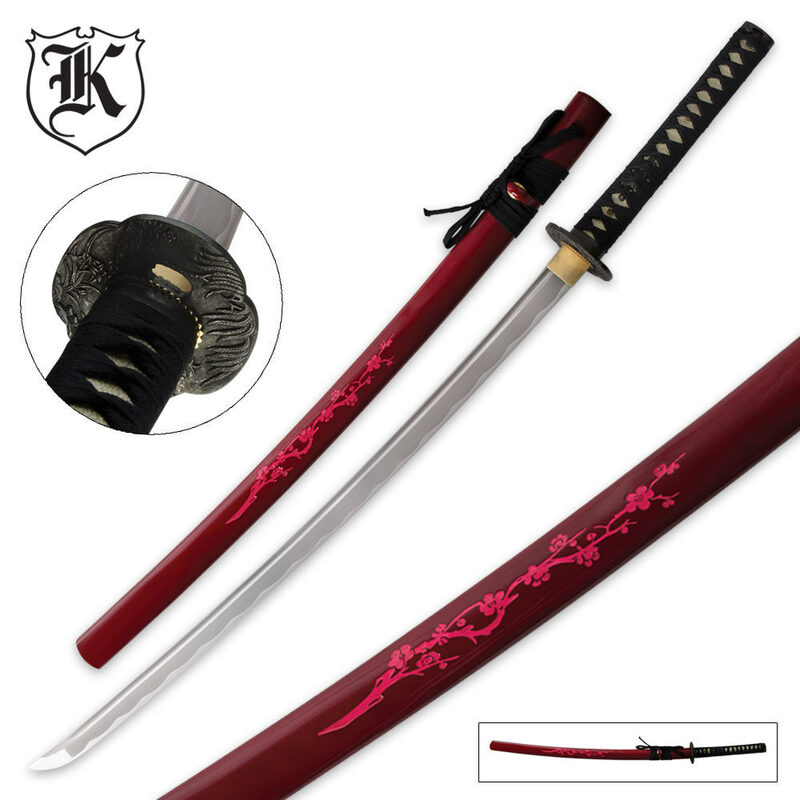 The deep red scabbard has a hand-painted cherry blossom design and corresponding cord wrappings. It includes a cloth dust cover for storage. Measures 39" overall. I got this sword on a Bogo deal and I am pretty impresse. For the price this is a handsome and quality sword. The picture doesn't do the sword justice as they never do. 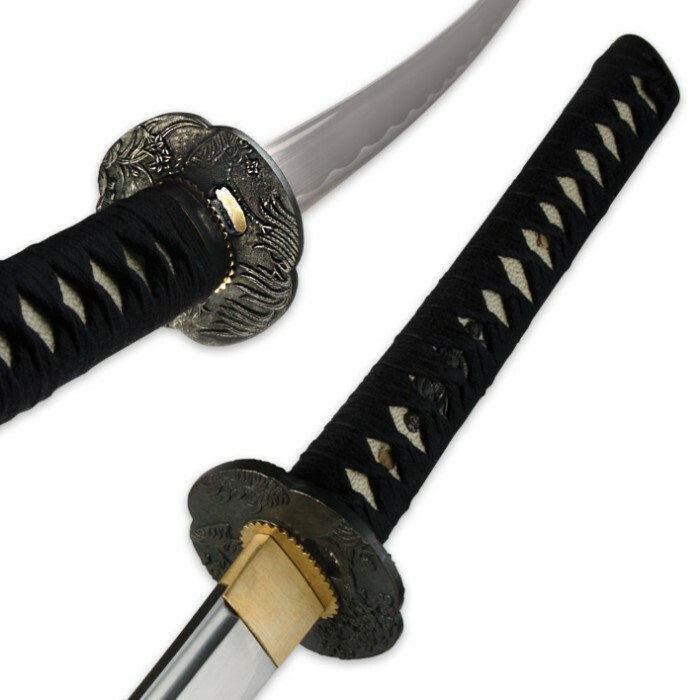 I was very surprised when I removed the blade and seen that it was as thick as one of my more expincive katanas, for $60 this sword is a steal. 1045 carbon steel is good for a light backyard cutter. It is full tang and comes sharp. The reason I gave this a 4 star rating is because the ray skin isn't real but it still looks nice, and also the sword has a fake Hamon, it's a natural flow though and doesn't look bad like you would expect from such a low priced sword, I would just rather it have no Harmon if not a real one, but like I said it looks way better than the cheaper display katanas Hamon. Over all If this sword didn't have the fake Hamon it could sell for over $100 easy, it probably could the way it is. I'm very happy with this sword and I plan to customize the free one I got with the deal. very Well made sword, just holding it you can tell, thick blade, full tang as they say. It fits very well into the sheath. It came very sharp and not a rough edge but a razor edge which impressed me. my only complaint is that is seemed to take a while to get here, but other then that it is a very good sword.